Gulf Drive Cafe is a Florida beach bar located in Bradenton Beach. Discover this great Florida beach bar. Unique Feature: Great place for a beach wedding!! Gulf Drive Cafe and Kokonut Tiki is the Anna Maria Island Sun's 2010 Readers' Choice for; Best Chef, Best Café, Best View and Best Overall Restaurant. The restaurant serves breakfast, lunch, dinner and island hospitality. Gulf Drive Cafe feature two large tiki huts and one has a beautiful and spacious bar. The other is for parties and weddings. There are also smaller beach side tiki bar tables. 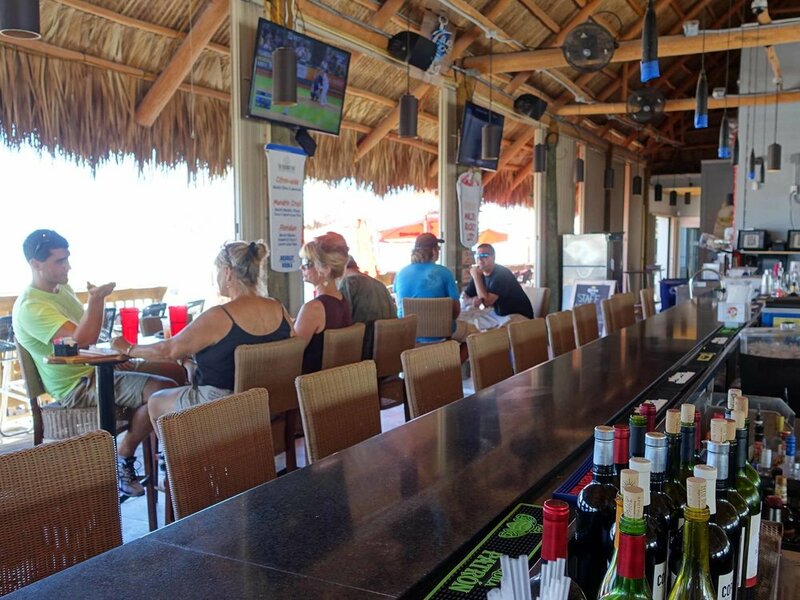 This Florida beach bar is the perfect place to gather with your friends. You can sit on the shore and enjoy the Gulf of Mexico during the day and spectacular sunsets during the evening. The tiki bar section is called Kokonut Hut. They have happy hour from 11:00 a.m. through 5:30 p.m. on Monday through Thursday. Sundays is Bloody Mary day with $5.00 Bloody Mary's. There are 10 flat screen TVs in the large tiki hut. What a fabulous place to watch a ball game and the Gulf of Mexico at the same time. Kokonut Hut offers several ways to enjoy this "toes-in-the-sand" beach bar. Sit under the cover of one of two large tiki bars around or choose your own private tiki bar complete with four stools and an umbrella. Either way the views are great with awesome sunsets.Just steps from the beach, this is one beautiful setting. The tiki bar is large enough to comfortably handle large crowds. It doubles as the perfect venue for a beach wedding or other beach side event. But most days it serves as a Florida beach bar with nightly music. The Gulf Drive Cafe and Tiki's restaurant serves breakfast, lunch, and dinner every day of the week. Because they know many visitors are on "island time", breakfast is available all day. The secret is out. This place is growing in popularity daily.